Did you know that using cotton buds can be harmful to your ears? The commonly used for cleaning, but this simple gesture can be dangerous for hearing health. Find out why we should not use them. It is one of the everyday gestures of personal hygiene, the use of cotton buds to clean ears. But beware, because this simple gesture, seemingly harmless, can be seriously damaging to the health of the ears. Sure after knowing the consequences will stop using them. Wax that forms in the ear canal, as the doctors suggest, plays an essential role in protection. In fact, the wax is part of the natural defenses of the body and its function is to ensure that the ears are free from any infection. The wax, in fact, keeps out dust and other debris in the eardrum, while function and exerts an antibacterial lubricant. In other words, it is a weapon of defense for your own ear cleaning. Clean ears with cotton buds can have negative consequences. So the first thing to consider is that you should not remove all the wax from the ear canal. 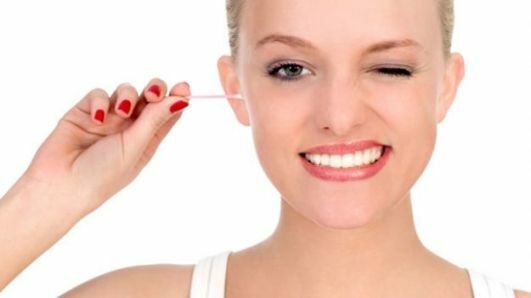 The cotton swab, in fact, may be small and inadequate to remove the wax and may even push it further into the ear. This would prevent the wax to exercise its protection function. The wax that is trapped in the deepest part of the ear canal may contain bacteria, viruses and accumulated fungi, causing infections and ear pain. But there is an even greater risk. And is that if, when cleaning the ear, we push too much wax can block the canal of the ear, with a risk of hearing loss. In these cases, you should always see a doctor or Otolaryngologist (ear, nose and throat), as if we consider that we need a revision of the ears to see if we have a plug or excess wax. Experts also give alternatives for cleaning ears, as cool as a mixture of peroxide and water used once or twice a month or apply 4-5 drops of vinegar and water once a week. Studies, as conducted by researchers at Henry Ford Hospital in the United States, have found a direct relationship between the use of cotton buds and ruptured eardrums, an injury that will heal by itself, but in more severe cases have to resort to surgery. If the buds is inserted too deeply into the ear canal can cause serious damage, including rupture of the eardrum is included, also known as tympanic membrane. The severe perforations can cause facial paralysis and dizziness.